Let me introduce you to Amrita Singh. Amrita Singh is a jewelry designer who creates unique, eye catching works of art. Amrita designs both fine and contemporary jewelry, finding inspiration in her surroundings: artistic, urban and diversity are some of the many things that influence and inspire this fantastic designer. Amrita graduated from FIT and interned at the famous Bergdorf Goodman. She has also had the opportunity to work with designers such as Oscar de la Renta & Christian Lacroix, and was even nominated by Fashion Group International for a Rising Star award in 2006, 2007 & 2008! Amrita Singh Jewelry launched in 2003, blending both the Old & New World style, which quickly garnered attention from the fashion world, celebrities & the every day woman. The Contemporary Collection contains not only jewelry but sandals, handbags, scarves and hair accessories as well. The Fine Jewelry Collection is available exclusively at Bergdorf Goodman. I was fortunate enough to be able to review a piece of jewelry from the Amrita Singh Contemporary collection. With so many eye catching, incredible pieces of jewelry, my decision was not an easy one. After much deliberation, I finally decided on the Nezahua Necklace. 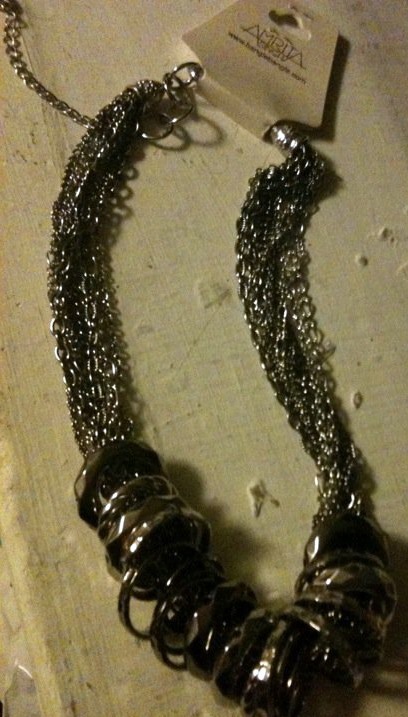 The necklace is silver and gun-metal placed with many round capsules that rest on the collarbone area of your chest. It is 20.75" long and adjustable up to 1.75". I chose this particular necklace because I loved the blending of edginess & sophistication. It could easily be worn with jeans,heels and a nice top or with a dress for a special occasion or night out. I was quickly taken in by the multiple chains of different designs that make up the main body of the necklace. The rings that are the centerpiece of the necklace are varying shades of gun-metal and silver which add a nice contrast. 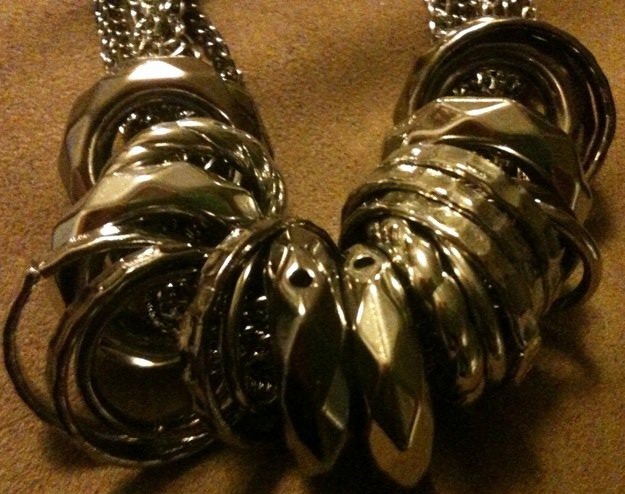 The necklace itself is not too heavy, and wears quite comfortably. Here is a close up shot of the multi-colored rings that flank the chains. As you can see, the rings are of varying designs as well. All in all this is one beautiful necklace which I will be styling over and over again! The Nezahua Necklace retails for $100 and can be purchased at the online store for Amrita Singh. HAVE YOU SIGNED UP FOR HAUTELOOK YET? IF NOT, AMRITA SINGH WILL BE FEATURED ON THURSDAY, JANUARY 22nd! SIGN UP TODAY TO CHECK IT OUT! *Thank you to Amrita Singh for providing the above necklace for review. No compensation was involved and my opinions and views were not influenced in any way.